Note: You can have up to twenty tabs in one Spread Matrix window. 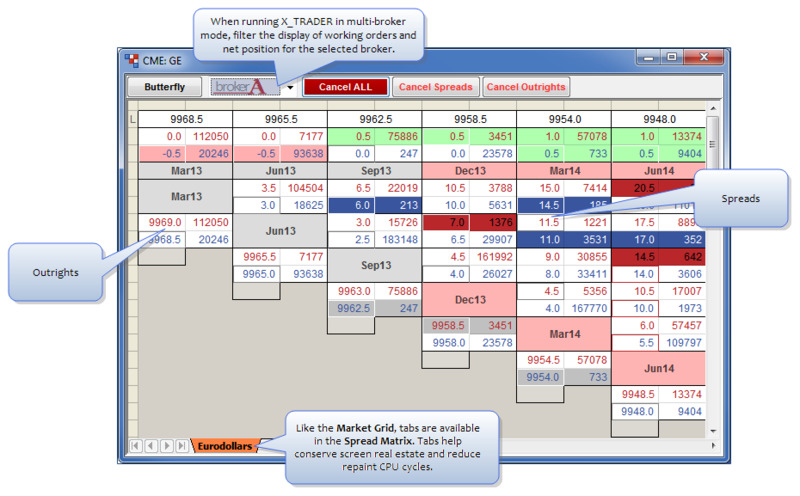 The Spread Matrix displays comprehensive market data for each outright contract and calendar spread. Note: You can trade using the Floating Depth Window. The background color of the market data cell provides additional information about the prices and quantities that comprise the bids and the offers. These colors are customizable via the global properties Color tab | Spread Matrix. Dark Blue or Dark Red The price and quantity are comprised of direct bids or offers in the market. Light Blue or Light Red The price and quantity is comprised entirely of implied quantities that were derived from outright orders and calendar spreads. White The Bid/Offer is a combination of direct prices and implied prices. Yellow You are working an order that is at the best inside market price. The Spread Matrix displays calculated implied data even when it is not at the best price. Implied functionality varies by exchange. They determine how the implieds settings function in X_TRADER. Enable the Calculate Implieds instead of Exchange Implieds feature on the global properties Trading tab. By default, the Spread Matrix color-codes implied prices and quantities. This is configurable via the global properties Spread Matrix tab. Colors also identify each one-year period. In this Spread Matrix, we see two one-year periods. As you place your mouse over a calendar spread, the cells comprising the spread highlight for easy identification. 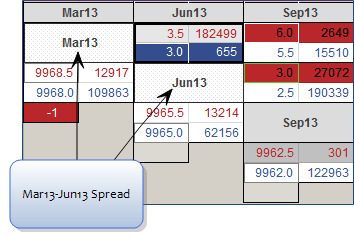 In this example, the moue is hovering over the Mar13-Jun13 spread.